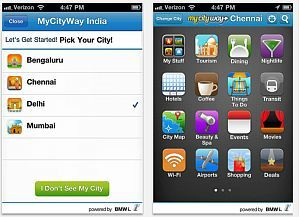 As part of its international roll out, MyCityWay, a New York based company founded by three Indian NRIs â€“ Archana Patchirajan, Sonpreet Bhatia and Puneet Mehta, which raised $5 million from auto maker BMW in March, has rolled out its location-aware app for mobiles in India. MyCityWay received $5 million from venture fund BMW i Ventures. It currently delivers information on public transportation, parking availability, and local entertainment for over 40 cities in the USA and planned a massive 40 city roll out across the globe this year. The MyCityWay app, according to the company, is 50 apps rolled into one, offering discovery and routing information to various points of interest such as hotels, landmarks. It also allows users to purchase tickets, check classifieds ads for nearby apartments and see live traffic feeds. According to DNA, the company has launched the app for Chennai, Mumbai and New Delhi and will expand to ten more cities shortly. The app is also available for Bangalore.